Philips 65OLED803 4K OLED TV review | What Hi-Fi? Simply one of the best TVs available, and that’s even without considering the bonus of the lovely Ambilight. We love OLED and we also love Ambilight. Little surprise, therefore, that we really love the combination of the two, which only Philips offers. The company’s second-generation OLEDs got off to a decidedly shaky start, with our first 55in sample proving buggier than Nick Knowles’ knickers. Thankfully, we experience no such issues with this bigger variant, the Philips 65OLED803, which makes this one of the finest TVs you can currently buy. It’s also one of the finest-looking TVs. The two feet are delightfully dainty and elegant, and keep the screen low to the furniture upon which it stands. Combined with the uniformly thin bezels, that has the effect of making the TV look a little less imposing than most rival 65-inchers. As with most OLEDs, the 65OLED803’s screen is thin but – also the norm for OLEDs – it has plastic casework attached to its rear, in which the set’s components reside. In fact, the OLED803’s casework is bigger than most, because it also houses the Ambilight tech, Philips’ proprietary feature that uses LEDs to extend the picture in the form of coloured light on the wall behind the TV. That might sound odd, but it’s effective at drawing you into the picture. If you have Hue lights, they can join in too, responding dynamically to what you’re watching. The TV comes with two remotes, one of which has an excellent, angular, sci-fi wand design. It features seven clickable symbols and a small, glossy touch panel in place of standard buttons. Disappointingly, this remote is a little too stripped back for its own good, leaving you reaching for the bigger, more traditional clicker. This one is a bit cluttered, and features a QWERTY keyboard that’s fiddly to use and only inconsistently available as a method of text entry. The Philips 65OLED803 (also known as 65OLED/12) features four HDMIs, all of which can handle 4K HDR signals (HDR10, HLG, and HDR 10+ are all supported). There are also two USB connections, optical and headphone outputs, and inputs for aerial and satellite. There are plenty of apps too, including Netflix and Amazon, both in 4K and HDR, plus BBC iPlayer, Rakuten (up to 1080p), YouTube, Plex, VLC and Spotify. The list is not complete, as not only is it missing Now TV, but also ITV Hub and All 4. The problem is that those apps are missing from Android TV itself, which the Philips runs as its operating system, but Sony overcomes the issue by integrating YouView. It’s a shame Philips hasn’t done the same. Android TV is generally improving with each update, and it runs fluidly on the 65OLED803, but compared with the bespoke operating systems of LG and Samsung, it’s still rather cluttered and fiddly in use. Pushing everything along is Philips’ own 2018 processor, the P5. The company claims this new chip brings improvements to colour, contrast, sharpness, motion, noise-reduction and upscaling, while also upconverting SDR content to HDR-like quality. Combined with LG’s 2018 OLED panel, which has already proven to be absolute dynamite, those improvements should result in an exceptional picture. Fire up the Guardians Of The Galaxy Vol.2 on 4K Blu-ray and the 65OLED803 impresses with vibrant colours and crisp bright whites. This is a punchier, more enticing picture than that provided by LG’s own 2018 OLEDs. Add in super-sharp edges and you’ve got an image that pops from the screen and delivers a real sense of three-dimensionality. Blacks are pure and, when combined with that punch, it makes for a supremely dynamic and exciting picture. Detail levels are exceptionally high in the film’s space scenes, such as the escape from the Sovereign fleet, allowing you to see the intricate design of the interior of Starlord’s ship and every strand of Rocket’s furry coat. But when it comes to the human characters, there is occasionally an issue with skin tones appearing a little grey and lifeless. It’s a peculiar problem, in that it doesn’t impact the set’s overall approach to colours, which generally balance the aforementioned vibrancy with subtlety to excellent effect. The other slight fly in the ointment is the motion processing. Judder is removed without the addition of the unnatural ‘soap opera effect’, but there’s more blurring than you’d see from one of Sony’s top TVs. The Perfect Natural Reality feature, which upconverts SDR to HDR, looks a bit inauthentic, but non-HDR content is lovely without it, boasting natural colours and excellent, unexaggerated contrast. Anything of a lower resolution than 4K is upscaled deftly, too, particularly in terms of detail. 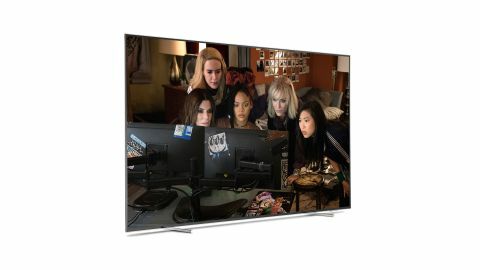 In fact, the OLED803 produces what may well be the most detailed 1080p picture currently available. Add those natural colours and sharp edges and you’ve got quite the HD image. With standard-def, a fair bit of picture noise creeps in, but that detail is ample consolation. Philips has put a lot of effort into improving the sound of the OLED803 over that of its predecessor. It has replaced the simple 2.1 system with a pair of units with separate tweeters and mid-range drivers, and added two passive radiators flanking the woofer on the rear of the set. Sure enough, this is a weightier, more full-bodied delivery than before, with a richness that’s rare for a TV. There’s also good clarity and directness to voices, too. It is a little lacking in punch and dynamics, but for a TV sound, it’s decent. We’d still recommend partnering the TV with a separate sound solution such as a soundbar, or you could opt for Philips’ step-up model, the 65OLED903, which has an integrated soundbar, supplied by Bowers & Wilkins. The Philips 65OLED803 promises much and delivers almost across the board. There’s the peculiar and occasional skin tone issue, and Sony delivers better motion processing, but this is otherwise one of the best performers out there – in some ways better than the LGs with which it shares a panel. Certainly, if you like the sound of OLED and Ambilight working in unison, you won’t be disappointed.